Backyard Aquaponics (Aquaculture + Hydroponics) is a very popular and easy way to grow fresh vegetables and edible or non-edible fish in your own yard. Aquaponics is very similar to Hydroponics but the difference being is fish provide the nutrients in Aquaponics and water is re-circulated. Water top ups will be required in summer. Hydroponics (no fish)means having to add certain nutrients to a system and eventually having to flush all the water. Aquaponics systems use the fish waste as the nutrient for the plants. There are no specific nutrients to add to the water and no flushing of water is required. Good quality fish feed is required. Water testing is recommended when new to Aquaponics. The water in the tank should not require changing if stocked to recommended levels. 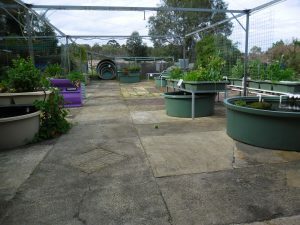 Growbeds filled with media(no soil) and plants, a tank full of water with fish.This is a simple way to grow your vegetables,herbs,fruits and even flowers. You can have edible or non edible fish as the nutrient additive. Goldfish and Koi are very popular as display fish. Silver Perch and Rainbow Trout are most popular of edible fish in Western Australia. Feed the fish and their waste is pumped up to the growbed by a submersible pump providing all the water and nutrients for the plants. The Maintenance required with these systems is very low. Top up the tank once a week in Summer . No filters to clean out because the growbed media becomes the filter .No cleaning of the tank walls or floor. Netting out any leaves that may have dropped in or uneaten food will be done as it occurs. The grow media may need old plant roots removed as plants are harvested. Composting worms will live quite happily in the grow media and will do a great job of breaking down old plant matter . No more struggling to keep plants nourished and watered . No more hours of weeding and preparing soil in your backyard for your home grown produce. Your back and knees will thank you for this perfect height and light weight gardening. 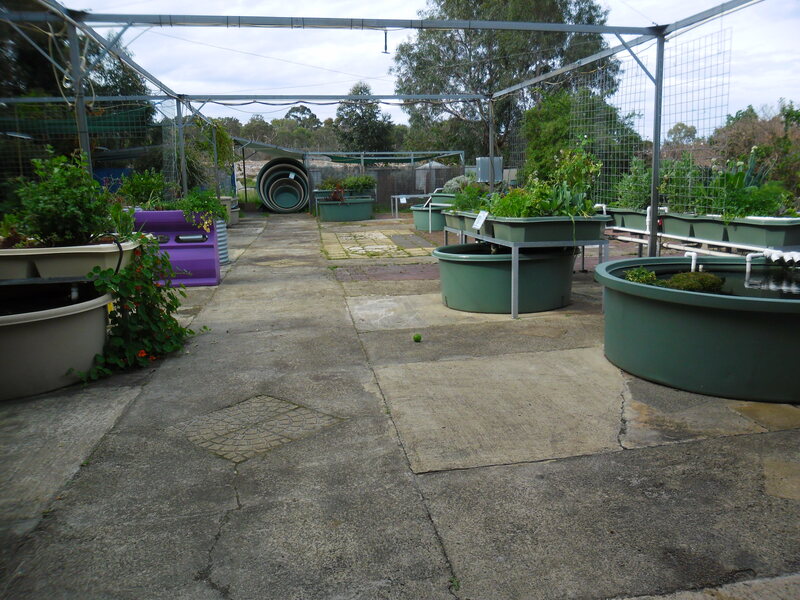 Aquaponics is great for people with busy lifestyles and minimal time to look after vegetable gardens. Fantastic for people without the ‘Green Thumb’. Great for simple gardeners who just let nature take care of itself or the ‘DIY’ sort who want to dabble and spend hours fine tuning. Pesticide Free vegetables grown in your own backyard for you and your family and ,of course, water saving! What are you waiting for?? All the fine tuning has been done for you with our magnificent systems.